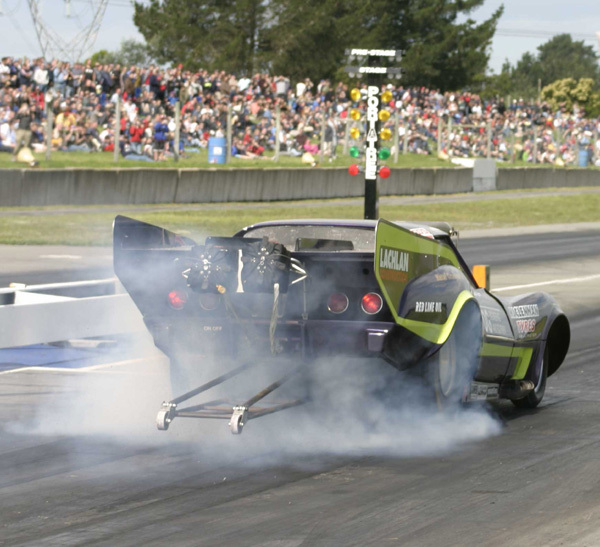 If the latest round of New Zealand's Drag Racing National Series is anything to go by, then NZDRA have been doing their homework and things look extremely bright for the future of drag racing. 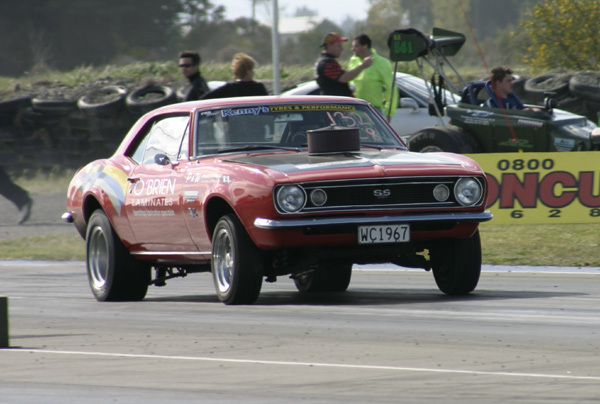 Firstly, the Powerbuilt Tools Southern Nationals held over Labour Weekend in Christchurch proved to everyone concerned that domestic vehicles will draw a huge crowd without having to resort to international stars as a gimmick. 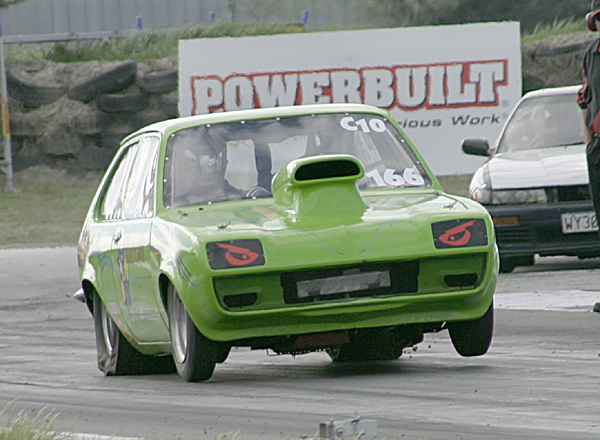 Secondly, the importance of a National series has enthused record numbers of travelling racers to compete all over the country......and thirdly, the value of the sport to corporate entities is being recognised in that Powerbuilt Tools saw fit to connect its brand to the sport for the first time. 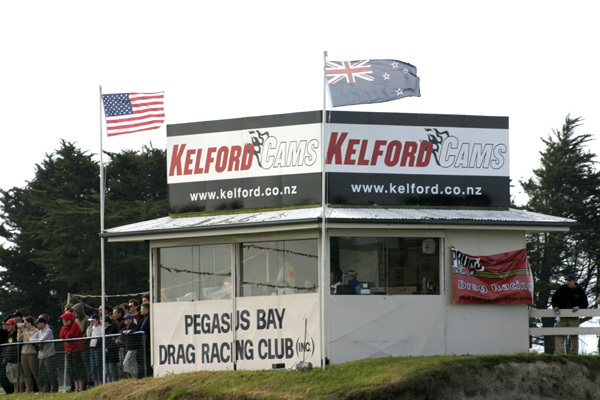 In front of a huge crowd of approximately 4000 spectators (the bank was full for most of the day), racing went down track in temperatures ranging from 30 degrees during the heat of the day, dwindling to a miserable 5 degrees when a biting wind got up late in the afternoon. 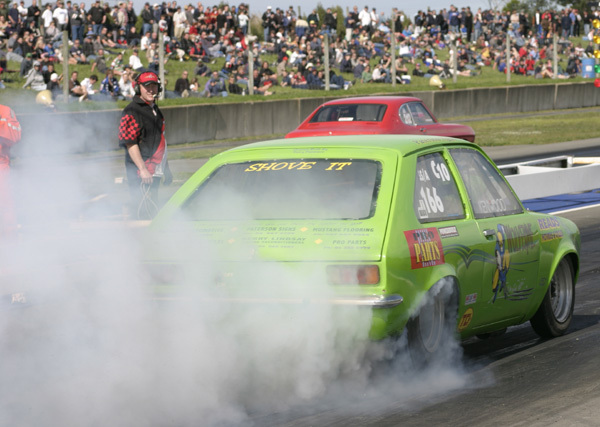 The enthusiastic Christchurch fans were treated to the largest field of North Island cars (nearly 20) to ever cross the ditch battling with another 75 from all over the mainland. 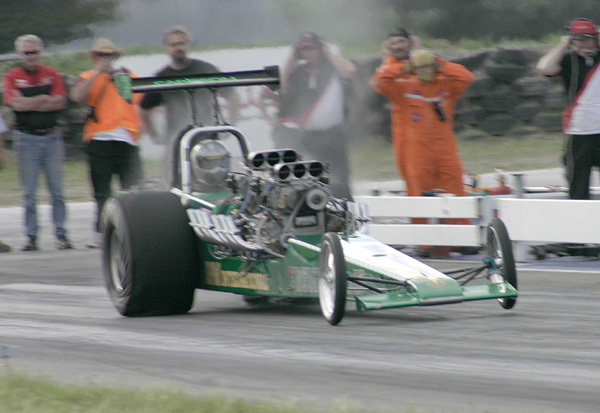 With plenty of traction compound applied to the surface there was no doubt performances would be stout, but when David Green spun out in his DG Engineering Top Doorslammer, everyone was made quite aware of overpowering the track if the tune-up was too aggressive. 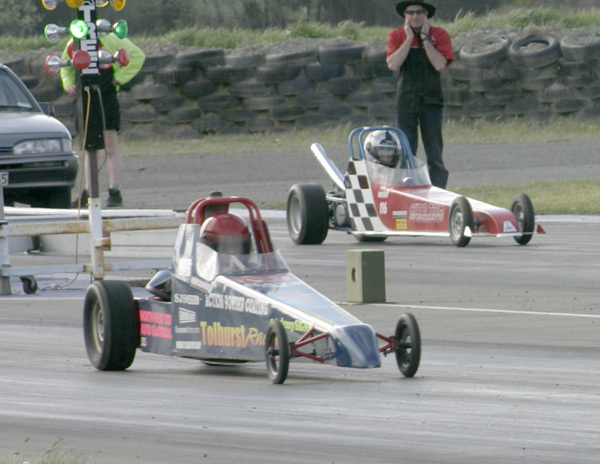 In front of a team of television cameras a total of 320 races went down track varying from middle six second blasts in Top Alcohol division through to upstart Junior dragsters running 18 seconds. 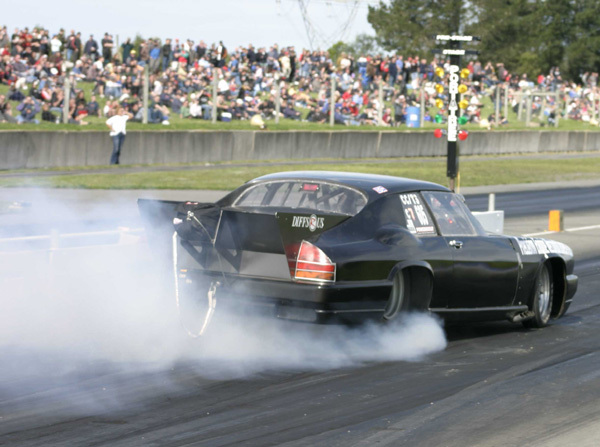 The Harcourts team met Brendan Seyb in the CEA Specialists Corvette in the final where he pulled a huge three car holeshot on Johnson to run a 7.26/185.95 in his nitrous assisted big cube Chevy. 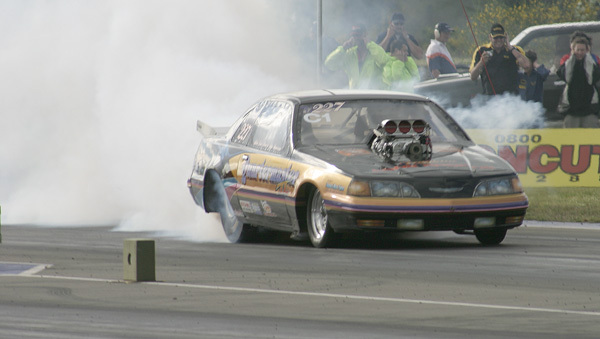 Unfortunately he had to watch as the blown Big Chief Chevy piloted by Johnson drove by for the quickest and fastest pass of the day, a 6.64/202.70mph blast to take the Powerbuilt Tools Southern Nationals title for 2004. 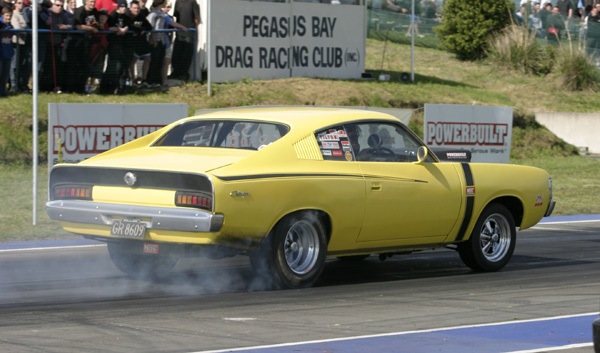 Top Doorslammer was the domain of six North Island cars and one lonely Christchurch entrant. Steve Batey was there to hold the flag for our mainland but his tune-up and drastic new paint job left everyone scratching their heads. 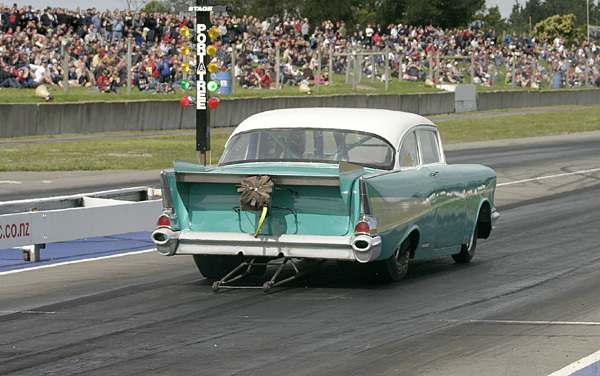 No matter what they did the '55 Chevy didn't even want to get out of its own shadow. On the other side of the field, it was obvious racers were serious. David Green flew in a secret weapon from the States.....hot off a near win at the World Street Car Challenge in Florida, Camp Stanley spent the day helping Green to tune some monster horsepower in the DG Engineering Corvette. 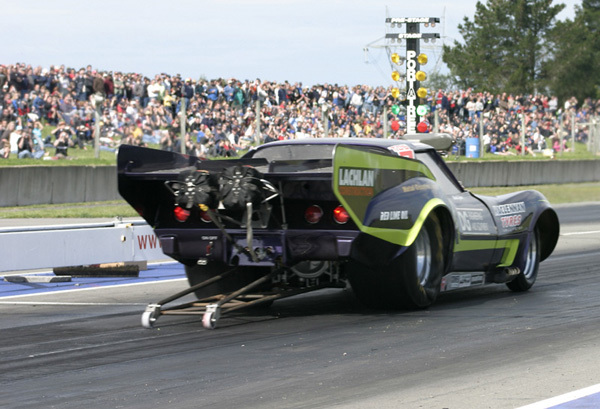 They quickly learned to back the clutch off as a major overpower of the track ended with Green spinning his Corvette a full 180 in the burnout on the first qualifier. 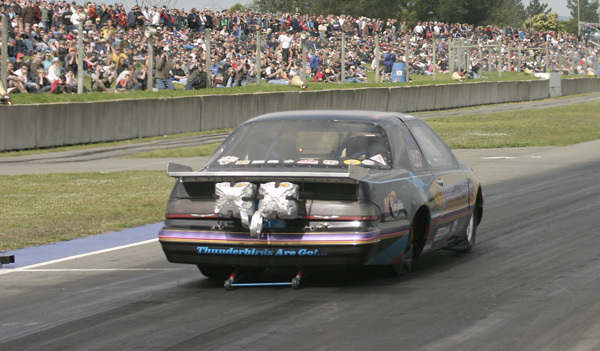 Pukekohe's Steve Bernasconi in the Quartermaster Thunderbird lead the way after qualifying was completed. 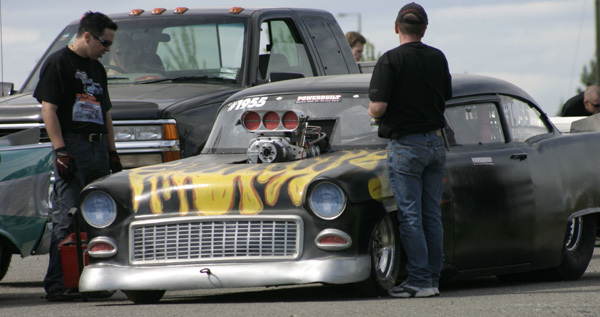 His 7.75 was way ahead of the rest of the field with laser straight passes from the blown 540 Chev. 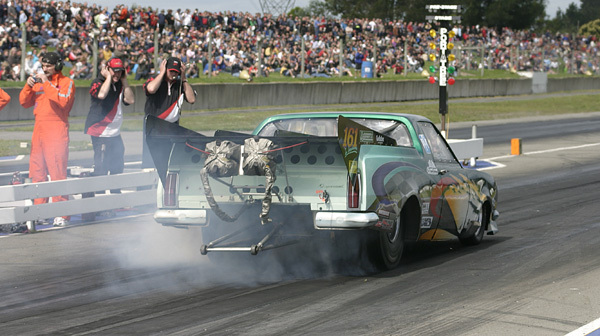 Surprise entrant for this year's Powerbuilt Southern Nationals was Whakatane's Tom Richardson in his 1957 Chev. 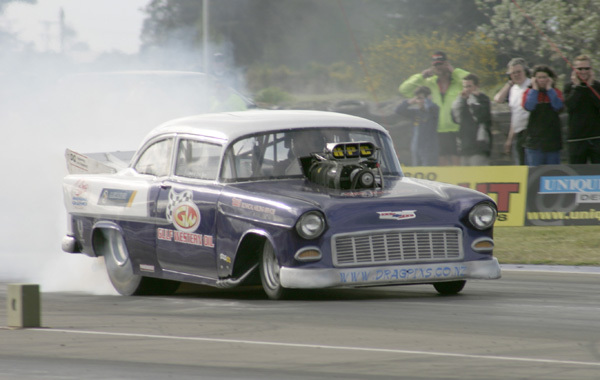 Running a mild 454 and Lenco 4-speed, even though the car had not seen action for 10 years, he was right at home behind the wheel and threw a string of low eight-second passes at the crowd along with Victor Bray imitations in his burnouts. Chris and Colleen Tynan made the trek down in anticipation of a fast pass or two, but found their new data logger teaching them a lesson. After three seasons of nightmares with the blown Big Chief combination they found four of their eight cylinders wouldn't fire. As an indicator of this engine's potential....how does a best of 8.59 on four cylinders grab you? 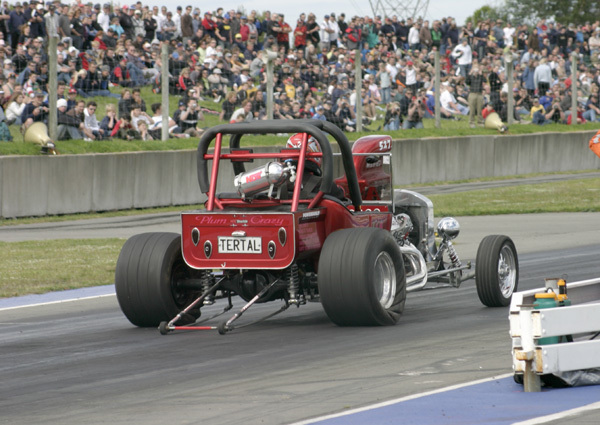 The final of Top Doorslammer was the closest race of the event and quite possibly the closest in the history of the class. 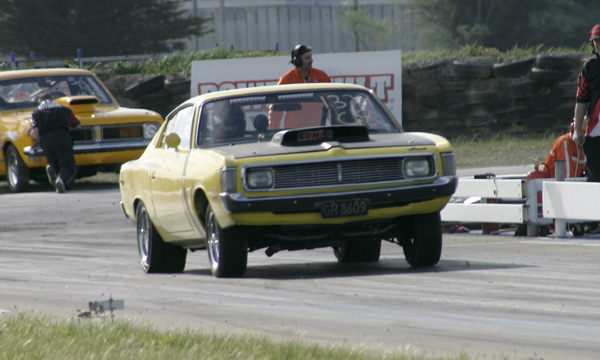 After battling an oil leak all day, Mark Thomas and Ryan Sheldon from Wellington took on Green for a real barnstormer. 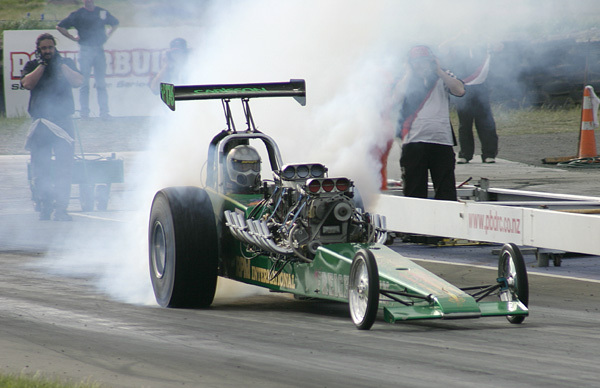 Just three-hundredths of a second (try to count that on your fingers) separated the pair at the pointy end of the track, Green taking the Powerbuilt Southern Nationals title away from Thomas with a 7.235/186.72 over a top-ending 7.262/190.68mph blast from the PPG/Redline Oils Holden ute. 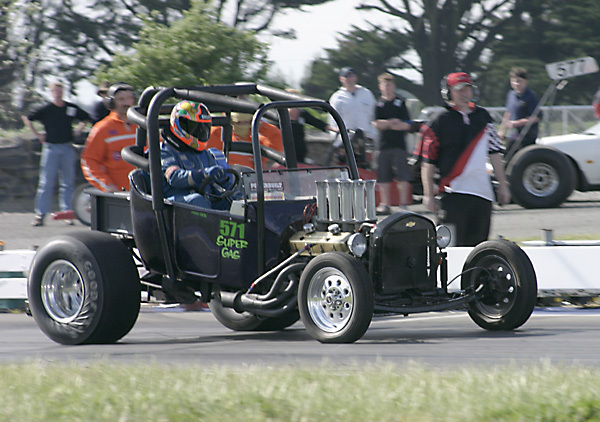 Top Street division of the Powerbuilt Southern Nationals was the domain of New Zealand's hard hitters. It was obvious this National Series is going to be hotly contested with the likes of Tony Bennis, Kelly Rennie and Laurie Urlich all travelling from the North to take on the likes of National Champion Roger Binnema and Brad Rosewarne from the South. 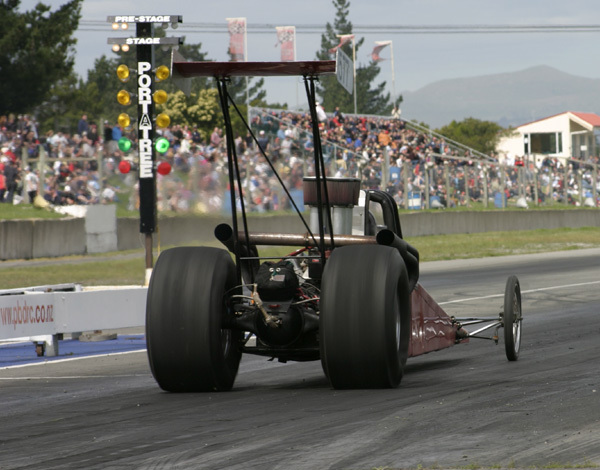 Binnema in his blown small block Honda eventually went out in the semis with a best of 8.69//162.45 while Tony Bennis and Kelly Rennie went into the final. 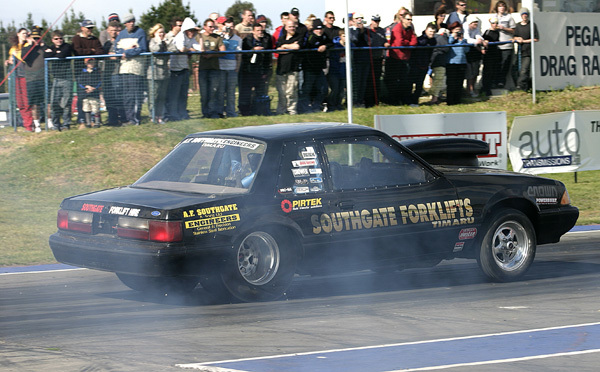 Bennis was having a play in the Top Street field after his favoured Super Stock bracket didn't have the required numbers to race. 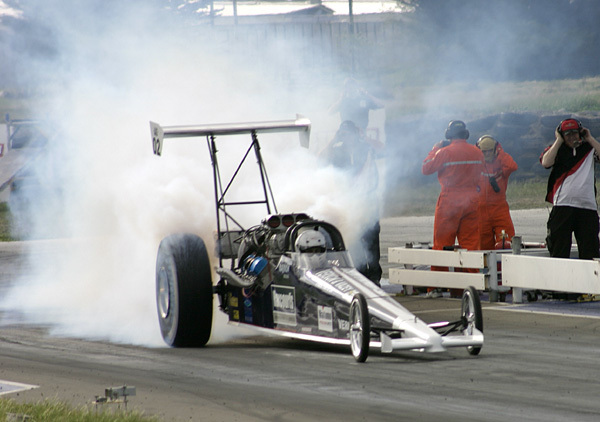 His decision proved a success as the Powerbuilt Southern Nationals produced the car's first eight second time slip. 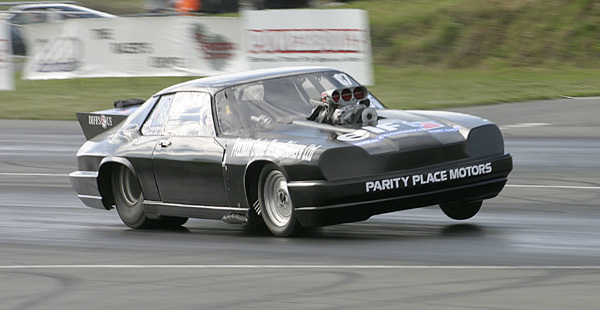 An 8.98/152.03 was enough to drive away with the title over Kelly Rennie's blown small block powered Jag. 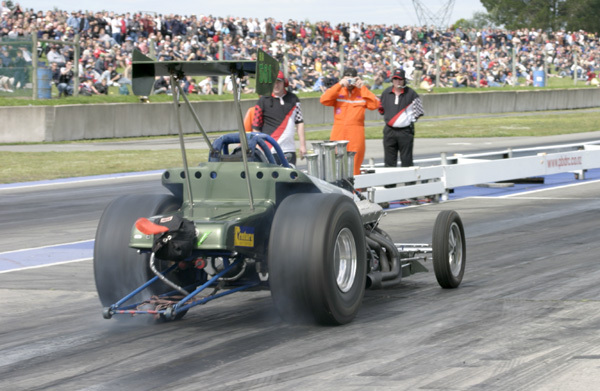 Rennie surprised everyone with his consistent crowd-pleasing antics, eventually pulling the front wheels so high the injector hat could be viewed from directly behind the car when leaving the line. His showmanship also lead to a series of fantastic middle eight-second passes in the 165mph zone. 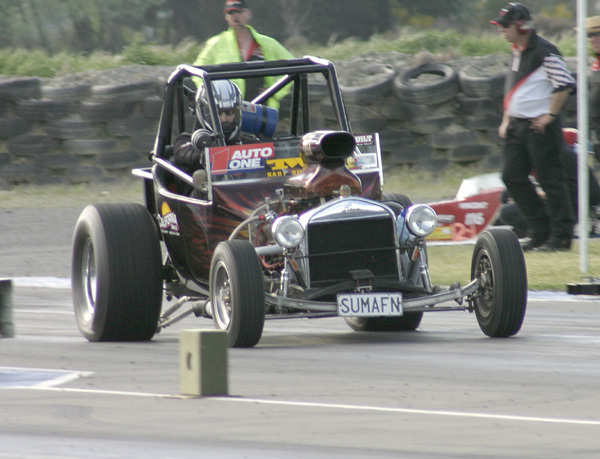 Competition Eliminator was a very small affair for this round of the NZDRA National Series. However, just because it was light in numbers didn't mean the spectators didn't see what they had come to witness. Matt Powell, one of a number of second-generation racers from around the country was at the helm of Ron Collet's spectacular new altered. 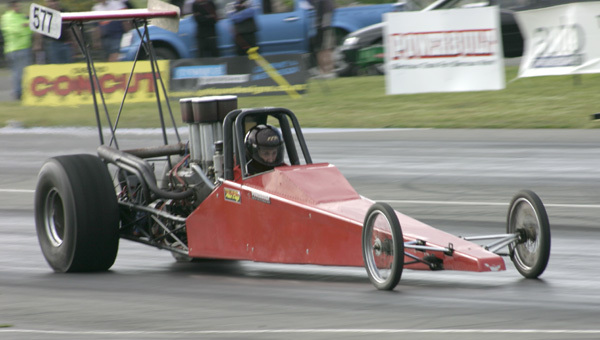 Running a very stout 434 cube small block Chev he went through to record a best of 8.31/162.45mph while taking out Tauranga's Ash Beck in the radical Ford Pop on 9.77/135.54. 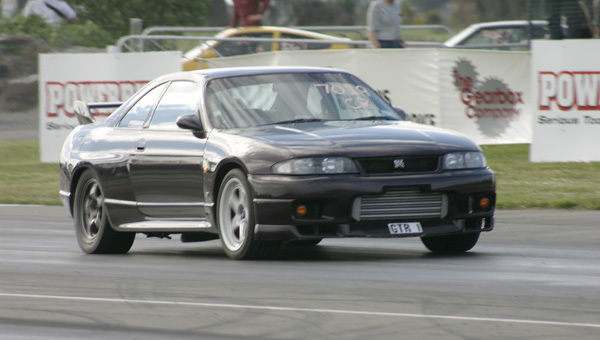 Super Sedan fielded an 11 car field with Terry Patterson in the Rice Rat Honda Accord from Porirua taking pole position with a 9.35/151.01mph over Evan Nicol's flouro painted Ford Pop ute running the Alsop blown small block on 9.96/143.77. 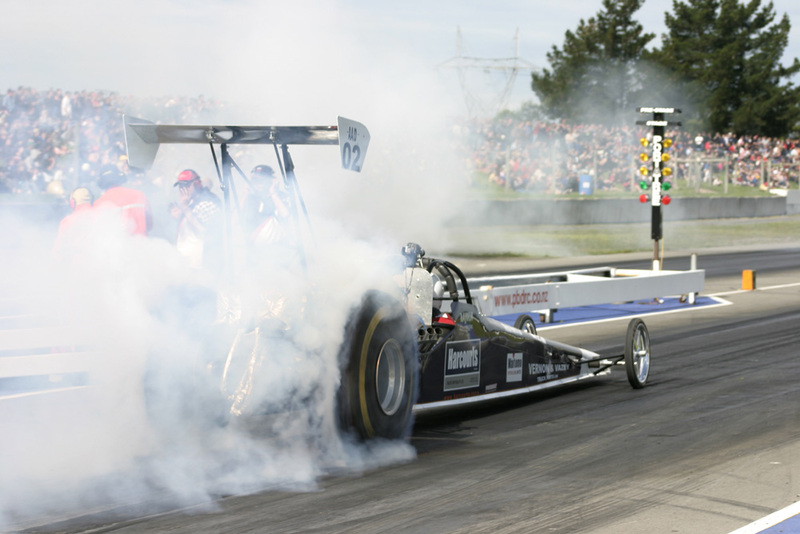 The final turned into a minor event as racers withdrew with mechanical damage throughout the day. 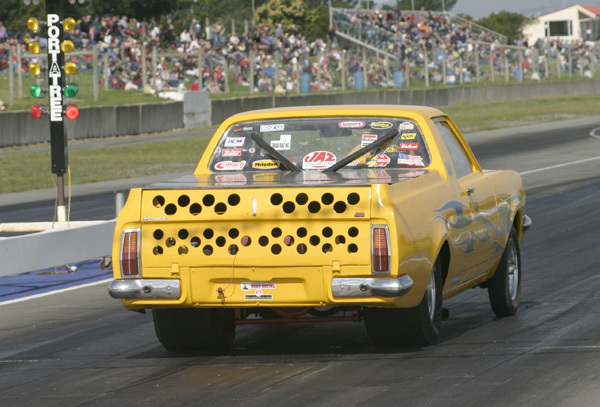 Eventually there was just one car left, that of Nelson's Tony Fleming in his staunch 355 Chev powered Capri. The immaculate mini-tubbed streeter ran as quick as 10.05/133.53 on his way to a bye round for the Powerbuilt Southern Nationals title. 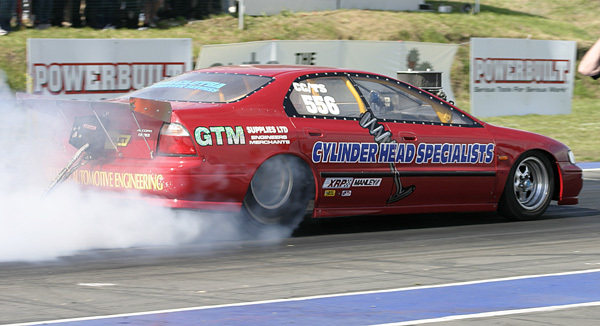 Modified eliminator saw Scott Tolhurst step into Alan Ryder's injected 406 Chev A/MD and drive around allcomers with his top qualifying effort of 8.77/149.01 as best for the day. In the final the bright red rail once again drove around a near two-second handicap to pull in Steven Rhodes Chev powered Topolino for the title. 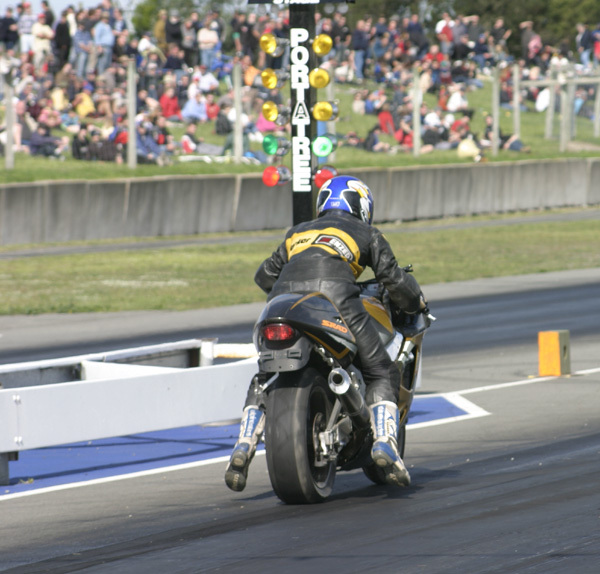 Super Gas was the domain of current National Champion Russell Lorimer until Tauranga's Steve Milne stopped him in his tracks. Lorimer top qualified but a huge holeshot from Milne in his 427 Chev powered Topolino left the current title holder in his wake. A 10.32 was enough to hold off the Mustang's 10.59. 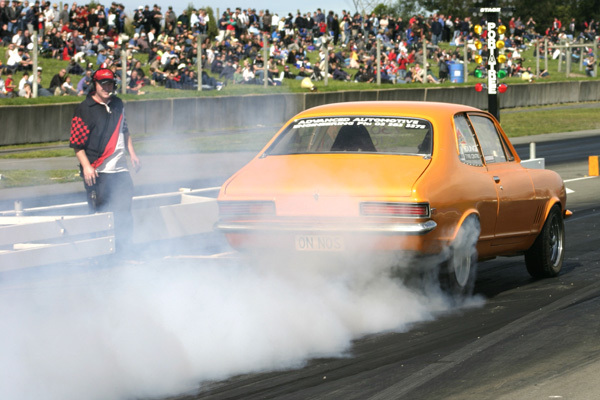 Super Street at this year's Powerbuilt Southern Nationals was the bracket of choice for a large contingent of entrants. 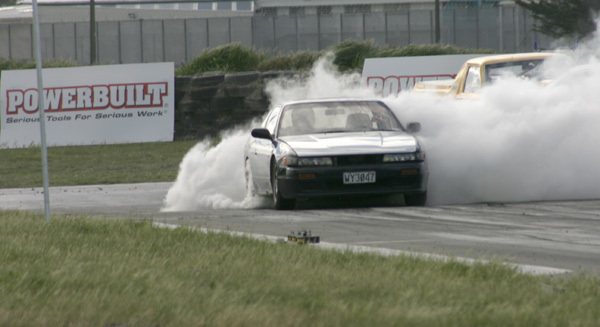 37 cars stepped up to do battle and it was a bad day for the dinosaurs unfortunately.....two jap cars went to the finals with Timaru's Matt Dunn doing the damage over local racer Luther Keats. 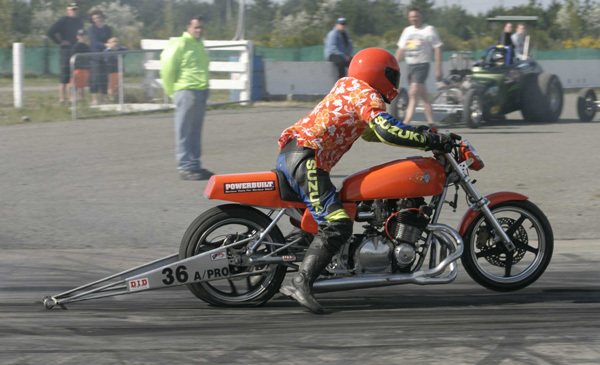 In Competition Bike the winner was National Record holder Glenn Johnstone, Street Bike saw Steve Taylor taste the honours and in Junior Stuart Minchington won his first Powerbuilt Southern Nationals title.